A piece of Old Las Vegas history came crashing down in Beatty earlier this month. Richard Stephens/Special to the Pahrump Valley Times The wind was powerful enough to rip the poles, still attached to massive blocks of concrete, completely out of the ground and to flip the entire sign 90 degrees from its original orientation. Richard Stephens/Special to the Pahrump Valley Times The sign is shown in this 2017 photo from a mountain bike event last year. The starting line was under the sign, which was blown to the ground by wind the night of April 11. Sometime on the night of April 11, a powerful wind gust, obviously much greater than the 41 mph gust recorded at the official Beatty weather station, toppled the “Free Parking” sign next to Gema’s Wagon Wheel Cafe at the intersection of U.S. Highway 95 and Nevada Highway 374. The wind was powerful enough to rip the poles, still attached to massive blocks of concrete, completely out of the ground and to flip the entire sign 90 degrees from its original orientation. Luckily, it did not impact any car or building. The ornate sign originally hung over the entrance to a parking lot at the Silver Slipper Casino in Las Vegas, and it had a small neon slipper in the center of its span. The Silver Slipper, on the Las Vegas Strip, across the street from where the Encore now stands, was at one time owned by reclusive industrialist Howard Hughes. It was closed in November of 1988, and the sign was purchased by the owners of the Exchange Club in Beatty when the Silver Slipper was demolished to make room for a parking lot for the New Frontier. 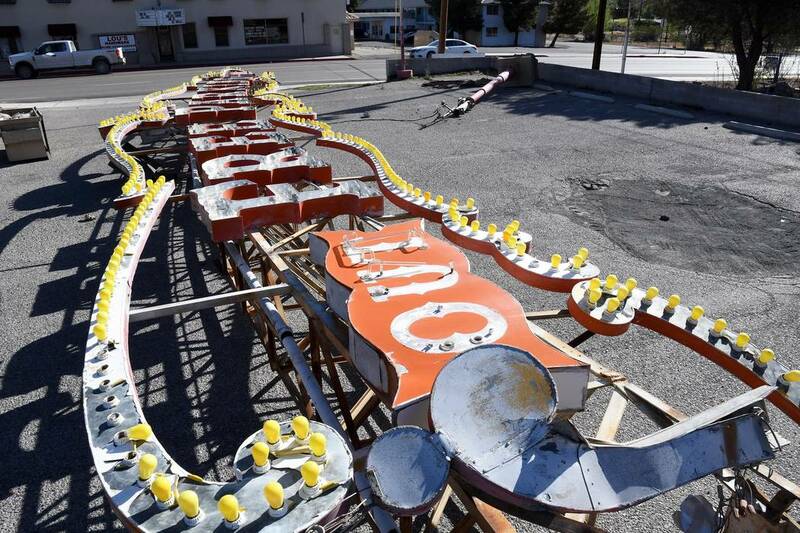 One item from the Silver Slipper, a giant, lighted slipper that once rotated atop the property’s main sign, is on display at the Neon Museum in Las Vegas.